We deliver caring, compassionate service so you’ll feel confident trusting us with your family’s health. Our pharmacists are available to assist with drug therapy regimens, dosage reductions, drug interactions and complications. Emergency pharmacy services are available 24/7, and all medications are delivered by our Sierra Specialty Pharmacy drivers. With our special medication compliance packaging, medications are dispensed in unit- or multi-dose packages. The individually sealed, sequential, easy-open packets are tamper-proof and clearly labeled with the drug names, strengths, descriptions, resident name and administration time. We accept most insurance plans, including Medicare Part D, and work directly with each resident’s insurance company to ensure proper coverage. We also can provide information to residents and their families on selecting a Medicare Part D plan. We reassure our patients and their caregivers that they will receive continuity of care throughout all stages of life, regardless of their physical location - at home, in assisted living, or a long term care facility - and we deliver caring, compassionate service so you’ll feel confident trusting us with your resident’s health. We work directly with resident’s healthcare providers to ensure they are receiving the all the right medications, minimizing the possibility of negative drug interactions. We also manage refills. Our Medication Administration Records (MARs) are easy to use and allow your staff to concentrate on the residents while helping ensure compliance with state regulations and ensure the right medication is taken at the right time. In addition to prescription dispensing, we conduct immunization clinics, supply DME products and diabetes expertise to improve resident care. 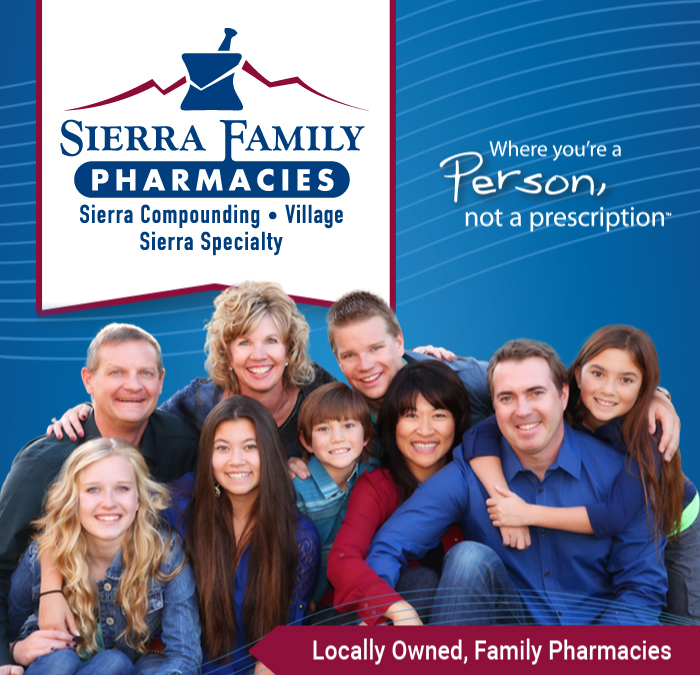 Sierra Specialty Pharmacy is a locally owned, family pharmacy and a proud member of Sierra Family Pharmacies (which also includes Sierra Compounding Pharmacy, and Village Pharmacy). Sierra Specialty Pharmacy is owned by third generation pharmacist David Vasenden and his wife Terry, and fellow pharmacist, Brant Skanson, and his wife Julie.